3M 60921i provides the classic protection against Organic Vapor/P100 threats, and also includes the 3M™ Service Life Indicator, a revolutionary end-of-service-life indicator (ESLI) utilizing nanotechnology that can help users determine when to change cartridges in appropriate environments. See User Instructions to determine if the indicator is appropriate for your work environment. NIOSH approved against certain organic vapors and particulates. When used in appropriate environments, the 3M™ Service Life Indicator can provide a simple, visual tool that can help users determine when to change their cartridges and provide confidence in protection. (See User Instructions to determine if the indicator is appropriate for your work environment. ) It’s designed to indicate service life based on individual exposure and respiratory use patterns, allowing the user to optimize cartridge use for their specific needs. The 3M™ Service Life Indicator is covered by a peel-back label to help protect it from overspray and debris. 3M™ Organic Vapor/P100 Service Life Indicator Cartridge 60921i helps provide protection against certain organic vapors and particulates in a variety of environments. The cartridge/filter combination may be used for respiratory protection from certain organic vapors and non-oil and oil particulate concentrations up to 10 times the Permissible Exposure Limit (PEL) with half facepieces or 50 times PEL with quantitatively fit tested full facepieces. This cartridge/filter is not for use in environments that are immediately dangerous to life or health (IDLH). Recommended applications for the cartridge/filter include chemical clean-up, chemical compounding, chemical transfer, laboratories. This cartridge/filter is commonly used in the following industries: chemicals, fiberglass manufacturing and transportation. See User Instructions to determine if the indicator is appropriate for your work environment. This organic vapor cartridge/P100 filter combination works with 3M™ Half Facepieces 6000, 6500 7500 and Full facepieces 6000, FF-400 and 7800 Series with bayonet attachment holders. The cartridge/filter is NIOSH (National Institute for Occupational Safety and Health) approved for environments containing certain organic vapors and non-oil and oil particulates. The cartridge/filter has been assigned the color code “Magenta/Black” in the NIOSH system. Breathing organic vapors and particulates can pose a risk to your health. 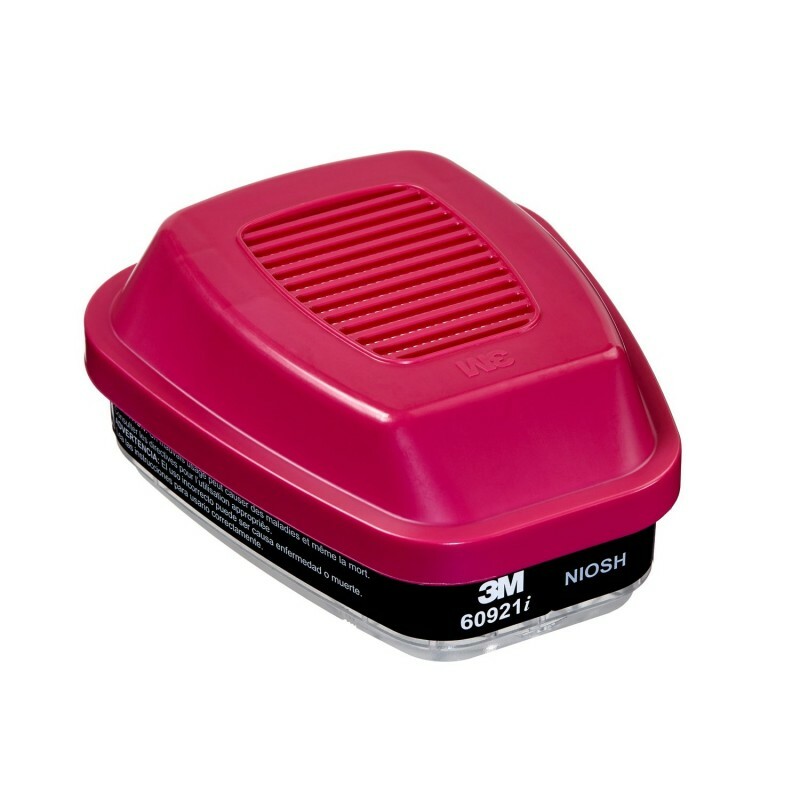 NIOSH, a Federal government regulatory agency, has tested and approved the 3M™ Organic Vapor/P100 Service Life Indicator Cartridge 60921i to help reduce exposure to certain organic vapors and particulates.